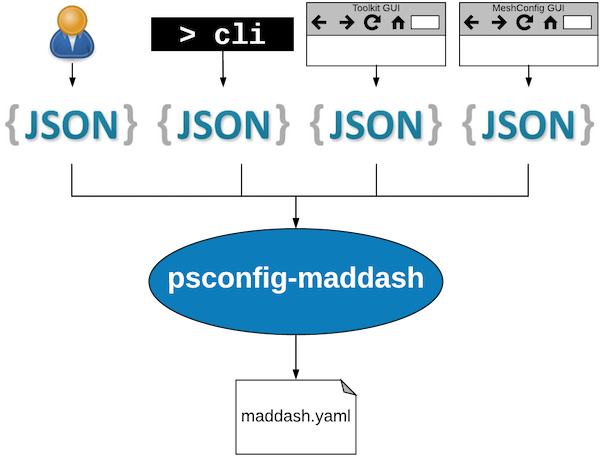 A diagram showing the psconfig-maddash-agent reading templates from a number of sources and generating a MaDDash configuration file. Within a configurable amount of time of a change to a local configuration file (changes to remote templates are not detected). By default the value is 1 minute. If no changes, on a configurable interval after the start of the last run. By default these steps are run every 1 hour. See Advanced Configuration for more detail on the configuration options mentioned above. The remainder of this section describes each of these steps in greater detail. The agents first job is to read a set of templates. The templates to read are configured by the administrator of the agent. For information on how to configure templates see Configuring Templates. After reading a template, an agent is also capable of performing local modifications. See Modifying Templates for more details. In Configuring Grids the process of defining how to display the tasks is detailed. After determining what to display, the agent outputs the result to /etc/maddash/maddash-server/maddash.yaml by default. At that point, MaDDash takes over and will detect the change within 60 seconds by default. Shortly thereafter visiting the MaDDash web interface should show the changes. The agent runs as the maddash user since this account owns the maddash.yaml file. This is contrast to many other perfsonar services that run as the perfsonar user or a user named for the component. This also impacts the owner and location of log files as detailed in Reading the Logs. Configuring remote templates by supplying a URL and desired options to the agent. This is most commonly done using the psconfig remote command. See Remote Templates for details. Configuring local templates that live on the agent’s filesystem either using the psconfig remote command or by copying the template files to a dedicated directory whose contents are automatically read by the agent. See Local Templates for details. The primary way to add, list, and delete the remote templates read by the agent is with the psconfig remote command. The psconfig remote command simply edits the /etc/perfsonar/psconfig/maddash-agent.json file. For most users it is recommended to use the psconfig remote command as opposed to editing the file directly as it is less prone to syntax errors. The above command will add the new template to the agent. The agent should begin reading the template within 60 seconds of the change if using default settings (i.e. no agent restart required). Unlike the pSConfig pScheduler Agent, the MaDDash agent will use archive definitions from templates with no extra options like --configure-archives. This is because MaDDash ultimately just uses the archives for reading data as opposed to writing results. Also, the agent would not be particularly useful otherwise since you cannot display results if you do not have them. The above command returns a list of JSON objects containing the template URL and any options set. The command accepts only a URL and will remove the agent’s pointer to that template. Within 60 seconds of executing that command, the agent will run and instruct MaDDash to cease display of any tasks from the removed template. The psconfig remote command is also the command used by the pScheduler agent to manage remote templates. If you have both agents installed on the same system, then any psconfig remote command will affect both agents by default. If you’d only like a command to apply to the MaDDash agent then add the --agent maddash option. Run psconfig remote --help for full details. Everything about the command works the same with a file path as it would with a http/https URL. See Remote Templates for more details on this command. Adding a new file, removing a file or updating a file within the template include directory will get detected automatically by the agent within 60 seconds of the change (i.e. no need to restart the agent). Files are read every 60 minutes regardless of changes when the agent checks on the state of the grids it has created in MaDDash. The agent will follow symlinks if you use those instead of copying the file directly, though it may affect the agent’s ability to detect changes (i.e. you may have to wait up to 60 minutes for the agent to see the changes). Template modification in the MaDDash agent works exactly the same as in the pScheduler agent. They both use the same commands and directories to perform these operations. See Modifying Templates in the pScheduler agent document for full details. After reading the templates, the agent needs to decide how to display the results produced by the task topology in MaDDash. Displaying the results requires specific instructions to be given to the agent with regards to which tasks to display and how to display them. By default the agent knows nothing about specific test types nor what to tell MaDDash to do with them. In order for it to translate a task to someting displayable it needs additional information. First of all it needs to associate a task from the template with a check. A check is an action to perform that generates a result for MaDDash to display. It consists of a command to run and additional information such as a URL to a graph. Usually this command takes the form of a nagios command since that is what MaDDash knows how to run. Building these commands manually is cumbersome so the pSConfig MaDDash agent ships with a number of check plugins. These plugins define the types of tasks they understand, the types of archives they know how to read and ultimately use this information map the task parameters into a command-line template that can be stored in maddash.yaml. Note that the agent DOES NOT run this command, it simply builds the command template string for MaDDash to run. The check also needs to be associated with a visualization. A visualization is a URL that points at more information about a task’s result. More specifically this is the graph displayed when a cell is clicked in the MaDDash web interface. This URL may also contain parameters needed to grab the results of the test. Similar to checks, the agent includes visualization plugins that build the URL based on the contents of a task. Finally, these two concepts are brought together into a grid. A grid is the unit of configuration that instructs the agent how to convert pSConfig template tasks into something MaDDash can display. It consists of a check plugin, a visualization plugin and any desired customizations allowed by each. Potential customizations include task selection criteria, check thresholds and many other parameters. The name grid stems from the fact that it ultimately translates a pSConfig task object into the grid representation fundamental to MaDDash. This is a fair amount of terminology but the MaDDash agent provides configuration utilities that hopefully allows you to ignore or explore as much detail as you want. The remainder of this section is about how to configure grids with these utilities. default_ping_loss - Creates grids of all rtt tasks that alarm on the packet loss values using a default set of thresholds. default_trace - Creates grids of all trace tasks that alarm on the number of unique paths seen using a default set of thresholds. default_loss - Creates grids of all latency and latencybg tasks that alarm on the packet loss using a default set of thresholds. default_throughput - Creates grids of all throughput tasks that alarm on the throughput values reported using a default set of thresholds. If you leave these grids in place and then add your own grids using the same check plugin, make sure you set the priority otherwise you may end up with duplicate grids in MaDDash. The –name is used to identify the check if later modifying it. Only letters, numbers, hyphens(-), colons(:) and periods (.) are allowed in the name (no whitespace or other specical characters). This value will be used in the name displayed if the --display-name option is not provided. In the example the check will be referred to as example_loss. The –check-type indicates the check plugin to use. The ps-nagios-loss plugin is selected in the example. That is a check that by default queries an esmond server for loss data from tasks with test type latency or latencybg. If you specify an invalid plugin the tool gives an error and lists the valid plugins. See Determining Check Plugins Installed for determining the list of plugins installed and how to get more info. The –visualization-type indicates the visualization plugin to use. In the example ps-graphs is used which is the standard perfSONAR graphs that can query esmond for throughput, latency, and loss information. If you specify an invalid plugin the tool gives an error and lists the valid plugins. See Determining Visualization Plugins Installed for determining the list of plugins installed and how to get more info. The psconfig maddash-grid add will not only add new grids but modify existing ones as well. Simply refer to the existing grid by name and provide the remainder of the options just like you’re adding it for the first time. The existing grid will be completely replaced with your new definition. This covers the basics of the maddash-grid command, see the remaining sections for more information on working with grids. It will give a list of plugins that can be passed to the --check-type option of the psconfig maddash-grid command. critical-threshold - The threshold at which a critical alarm is raised. The units are check specific. warning-threshold - The threshold at which a warning alarm is raised. The units are check specific. check-interval - The amount of time as an ISO8601 to wait in between runs of a check. For example, if you want the dashboard to check a value every 4 hours, this would get set to PT4H. retry-attempts - When a state change is detected (e.g. a check that was previously OK crosses the critical threshold), the number of times to retry before changing that state in the dashboard. retry-interval - The amount of time as an ISO8601 to wait in between retry attempts. If not specified, check-interval is used. timeout - The amount of time as an ISO8601 to wait for a check to complete before labelling the result with an UNKNOWN state. params - This is a check-specific object that contains parameters specific to the check in question that can be manipulated. An example might include the amount of data to query each time a check is run or additional filters for the result. report-yaml-file - This property is only for advanced users. The path to a YAML file defining that can be inserted into the maddash.yaml reports section that defines pattens that generate the reports seen above grids and used to generate email notifications. For information on manipulating these values see Adjusting Thresholds and Other Parameters. For many cases the default settings will be fine, but it is likely that at some point you may want to make adjustments. One of the most common changes to make is adjusting the thresholds used to alarm on values. You can adjust these by using the --check-critical-threshold and --check-warning-threshold of psconfig maddash-grid add or psconfig maddash-grid edit commands. The values accepted by these are check dependent. time-range is not guaranteed to be supported by all checks since it is check specific and may not apply. Most of the checks beginning with the ps- prefix support it, but see Determining Check Plugins Installed for details on determining what values a check supports. Note that we have to specify the check-specific value as a JSON string. There are numerous other options you can control, see psconfig-maddash-grid --help and the remaining sections for more details. A task selector defined that tells the grid to only select tasks with certain features, in this case a name. Priorities defined that indicate that only one grid from a group of grids should be matched to each task so we don’t end-up with MaDDash drawing two grids of the same type for the same task. Looking first at the selection criteria, the above examples add the --selector-task-name to the psconfig maddash-grid add command with the name of the task from the template we want to match. There are other selector options based on the archive type or a custom JQ script, see psconfig maddash-grid --help for more details on those. tasks_low is a test of type throughput, so it would match the default_throughput archive and MaDDash would create a grid for that. Since we also added a second grid called low_throughput which requires a test of type throughput and a task of name task_low which also matches, then a second grid would be drawn by MaDDash. In the case of tasks_low and tasks_high we get an extra grid drawn by MaDDash if we don’t specify the priority. Priorities have two values: the group and the level. The group is a custom name, and only one MaDDash grid will be drawn for a task per priority group. We named our group throughput in this example. Within the priority group, the grid selected is the one matches the selection criteria AND has the highest priority of those that match. The default_throughput has a priority of 1 in our example. We set the priority level at 2 for our new grids. With this set, that means the grid with the --selector-task-name option set has the higher priority, so it will be favored if it matches. Note that in our example the --priority-level is the same for both low_throughput and high_throughput, which is fine since it is impossible for a task to match both. If this were a case where we were using a different selection criteria that made it possible for multiple grids with the same priority match, then the first grid encountered will be used. This is not very deterministic so it is generally advised you avoid situations where it is possible for two grids in the same priority group and with the same priority level match the same task. The examples above show just changing the thresholds, but we can set any parameters in the new grid, just make sure the selectors and priorities are defined as desired. If this property is not defined then an auto-generated value will be used that is much uglier. Remember that you can use transform scripts to have the agent modify the JSON including setting the display-name if one is not set in a remote template. The final part of the grid name comes not from the template, but from the agent. It will either use the value given to the --display-name option when running psconfig maddash-grid add or the --name option if the former was not specified. The command psconfig maddash-grid list should show the current value of display-name for each grid. One of the first steps to perform when debugging the pSConfig MaDDash agent is to get information about the last time the agent ran. A run in this context describes an instance when the agent downloaded all the templates it is configured to use, made any local modifications, matched task to configured grids and output the maddash.yaml file. As described in pSConfig MaDDash Agent’s Role, a run can be triggered by the passing of a set time interval (60 minutes by default) or a configuration file change. Agent Last Run Start Time is the time when the agent began its last complete run. Agent Last Run End Time is the time when the last complete run ended. Agent Last Run Process ID (PID) is the process ID of the agent at the time of its last complete run. This should only change if the agent is restarted. Agent Last Run Log GUID is a globally unique ID used to identify a run in the logs. You can grep the log file with this ID to get the information about a specific run. Total grids managed by agent is the number of pSConfig task objects that match a grid configured by the agent from all input sources. From include files is the number of pSConfig task objects that match a grid configured by the agent that come from templates in the template include directory. Directly underneath that is a breakdown of the task count by the file from which they originate. From remote definitions is a count of the number of pSConfig task objects that match a grid configured by the agent that come from URLs added using the psconfig remote command. Underneath is a breakdown of the task count by URL. When did my agent last run? What templates is it using? Is it building the expected set of grids? This script may not give all the answers, but will hopefully get things started when debugging unexpected behavior of the agent. The agent log lives at /var/log/maddash/psconfig-maddash-agent.log and tracks basic information about agent activity and any errors encountered. A symlink can also be found at /var/log/perfsonar/psconfig-maddash-agent.log for convenience. You can further filter that output if needed, and hopefully eventually find the information needed to solve any issues encountered. The primary configuration file for the agent lives in /etc/perfsonar/psconfig/maddash-agent.json. Generally you should not have to edit that file directly, but if you are interested in the full set of options available, then see the schema file. This section will be expanded upon the completion of a command-line tool to aid in configuration.